David Cooper,owner of a new IT company, has enjoyed the convenience of skypemate software. He said that they had cost nearly 10 percent of the whole sales volume on the communication expense before. Especially during the financial crisis last year, it became a heavy burden, which includes telephone, mobile phone, fax machine and so on. However, after using the software with an usb phone, there’s only more room for profit but more efficiency for work. First of all, skypemate software is a remarkable way to save money on communication expense. There’re many network chat tools for us, such as skype, yahoo messenger, MSN messenger. As to the skype, you can not only communicate with each other on the Internet, any phones are available with a low expense. Compared to high expenses on international calls, it is really cost-saving and convenient. Normally, due to a large traffic volume, enterprise users will get better prices. For those who have phone calls frequently, usb phone is a good choice. Currently, most usb phones are below $100. Then it will be no need to worry about the missing calls, while you can set different telephone rings as you required. Furthermore, you can call any places in the world by VOIP with a good quality. Next, it is a great way to save money on equipments purchasing. As is known to all, the quality of service is very important especially for new enterprises. Therefore, they have installed many communication devices in every single office. Besides, the expense of mobile phone fee comes to be a huge cost. Cmparatively speaking, skype will relief you from all these costs. Only if the skype installed, you can have a phone call to anyone in anywhere. 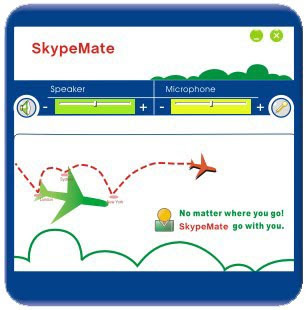 Of course, you can download a skpymate by free in our website with both skypemate vista and windows 7 available. Therefore, you can not only save a large amount of money, but more convenient in interior and exterior communication, such as network video teleconference and status of all staffs. Actually, many enterprises have take advantages of these kinds of software. With the advanced technology and low cost, it will become part and parcel of your business. In addition, it is also useful to home users. You can have a phone call to friends abroad and family member on a business trip. With it, even a very long distance is out of question.